ConocoPhillips has ordered a powerful new drilling rig that will surely crush long-distance drilling records in Alaska while allowing the company to unlock oil from a new field northwest of the Alpine development. The company said on Thursday it has signed a contract for the building of the rig with Doyon Drilling Inc., an Alaska Native corporation. The news comes on the heels of an announcement from ConocoPhillips last week that it set a new mark for drilling length in Alaska with a 5-mile well at its CD5 field on the North Slope. This new rig, set to arrive in Alaska in 2020, will allow development of Fiord West, a field discovered in 1996, the company said. It will be able to drill wells 6.25 miles long, more than the 4 miles often drilled by long-reach rigs in Alaska. ConocoPhillips has drilled exploration wells at Fiord West, but is not ready to provide details on how much additional oil the field will add to the trans-Alaska pipeline, said Natalie Lowman, communications director for ConocoPhillips Alaska. The pipeline, moving the oil that pays most state income, is shipping an average of 508,000 barrels daily this year, down from the peak of more than 2 million barrels daily in the late 1980s. Gov. Bill Walker said the drilling unit will have a "multiplier effect" on the economy. He lauded ConocoPhillips and Doyon for efforts to "spur production during fiscally challenging times." "This is welcome news, as it fulfills lease terms for Fiord West, which is near Alpine in the Colville River Unit," he said. Most of the leases are on land jointly owned by the state and Arctic Slope Regional Corp., another Alaska Native corporation. The state would receive royalties, as well as property, income and production taxes from the development. The rig will employ about 100 people during operations – 50 workers in two shifts – and support hundreds more jobs, such as contractors involved in transportation, drilling materials and logistics, ConocoPhillips said. "The addition of this rig to Doyon Drilling's fleet means more jobs and more opportunities for development," Aaron Schutt, chief executive of Doyon Inc., owner of Doyon Drilling, said in the statement. ConocoPhillips touted the environmental benefits of extended-reach-drilling, saying it shrinks development impacts because much larger areas of a reservoir can be drilled from a single site. They reduce the need for larger or additional gravel drilling pads to be built on the sensitive tundra. The extended-reach wells are also more cost-effective than traditional wells for the same reason. The new rig will more than double the underground acreage reached from a 12-acre gravel pad compared even to today's standards in Alaska, allowing drilling to radiate outward to reach oil in an area totaling 125 square miles, a company illustration showed. "Existing rigs do not have the capability to access Fiord West from existing infrastructure," Lowman said. "An ERD rig will access the Fiord West resources earlier, at less cost and with less infrastructure than a new pad development." ConocoPhillips said the rig can open up exploration and oil production at other fields, too, including at the Greater Mooses Tooth 1 project in the National Petroleum Reserve-Alaska scheduled for construction next year. ConocoPhillips has ordered two other new drilling rigs since the Legislature in 2013 approved a new oil tax supported by industry. Despite the oil price slump, the company did not halt the rig orders, said Lowman. 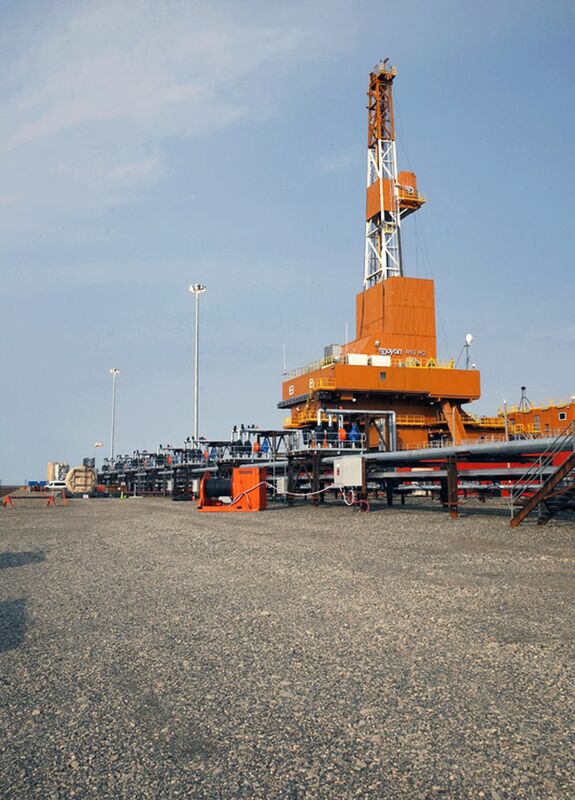 ConocoPhillips operates five drilling rigs on the North Slope. The new Doyon 142 arrived early this year. A new coiled-tubing drilling rig arrived this month at the Kuparuk River oil field, the second-largest field in Alaska. The newly ordered rig will be able to circulate drilling fluids known as mud at high speeds, and a high derrick rating means the rig will be able to support long, heavy strings of pipe, Lowman said. Also key is the use of stronger drill pipe, higher-capacity pumps and a more powerful top drive that will provide the torque to drill long distances horizontally.